-Keep it "Simple" When you make things easy and clear for your customers, they'll change from the status quo. -Be "iNvaluable" You have to stand out by being the person your customers can't live without. -Always "Align" To be relevant, make sure you're in synch with your customers' objectives, issues, and needs. -Raise "Priorities" To maintain momentum, keep the most important decisions at the forefront of their mind. "SNAP Selling" is an easy-to-read, easy-to-use guide for any seller in today's increasingly frenzied environment. Jill Konrath is a sales strategist and speaker whose clients include IBM, GE, and Hilton. Her first book, "Selling to Big Companies," was praised by Fortune as a must-read. She writes a popular blog and newsletter at SellingtoBigCompanies.com. She lives in St. Paul, Minnesota. "In this crazy busy world of ours, Jill Konrath's strategies are just what sellers need to be successful with today's frazzled decision makers." "How do you feel when a salesperson says: 'I want to tell you about my product'? Jill Konrath knows, better than anyone else, that busy people hate to be sold to and they don't buy products. Jill also knows what does work -that people are eager to invest in things that make their life better. Her ideas rock." "SNAP Selling presents an entirely new way to think about sales and selling-your customers, quotas, and partners will thank you for reading this book." "Attention sellers: Jill Konrath has got your back if you want to increase your sales with busy decision makers. She's a straight-talking sales powerhouse who's committed to your success." "Even in a slumped economic climate, Jill's teachings have helped our company significantly increase sales revenue. This is a relevant, motivating, and inspirational guide for sales professionals who want to get noticed by today's decision makers." "SNAP Selling is a must read book! Jill Konrath changes the game of selling by helping sellers focus on "SNAP Factors" to understand of how their prospects actually make decisions so they can improve their sales approach step- by-step and win more sales." "Konrath has it right. It's all about relevance, urgency, simplicity and credibility with today's buyers. The SNAP Selling strategies make it easy to help buyers make decisions in a seller's favor. As always, her thinking is fresh and her ideas important." "Executives lives are chaotic and frazzled. But they're the buyers, and if you want to get their attention, keep their attention, and persuade them to buy from you, you must read Jill Konrath's SNAP Selling. If you only have room for one sales book on your shelf, this is it." "Buyers are fried, frazzled and frenetic. Jill Konrath took that "obvious" insight and rewrote the book on selling. Turns out it has massive ramifications for consultative selling, how you communicate and your entire sales process. SNAP Selling is more than a good acronym-it's a sales book for our times." "Wake up! In today's economy, your sales team is your primary competitive advantage-not your products or services. SNAP Selling clearly articulates the knowledge and skills they need to dominate the market." "This book artfully reveals the key insights every salesperson or sales exec better know if they want to be a top producer today." "SNAP Selling is a Sales 2.0 survival guide for this decade. In it, Jill blends her years of selling experience, sharp wit and Midwestern sensibility, to create a valuable resource for the modern sales professional." "Jill Konrath has written the definitive book on how to sell in an internet- driven, time- pressured, information-overloaded world. Her truly innovative SNAP Selling strategies leave other sales models in the dust and are guaranteed to have your sales smokin' faster than you can say 'ready, aim, fire!'" "Jill Konrath has done it again! SNAP Selling offers a clear strategy for how to reach, engage, and sell to today's hyper-connected, on-the-move business leaders. Kudos for showing us the roadmap." "Having a unique perspective on the sales performance and sales training business, I see Jill Konrath at the top of the heap when it comes to practical ideas, loyal followers, understanding of the critical selling issues today, and most important, relevance. I not only recommend her books, I recommend her." -Dave Stein, CEO and founder, ES Research Group, Inc.
"Jill Konrath has an incredible gift that she shares in this book. By leveraging her vast sales wisdom, she delivers precise, relevant, and timely solutions that solve the most pressing challenges amongst today's sales force. Jill lasers in with pinpoint accuracy on the unique needs of today's sales professional, providing them with selling strategies that shift personal productivity into hyper-drive, accelerate customer interest and win more sales." "As a corporate leader, time is my most precious commodity. If I'm working with a seller who has been smart enough to take the SNAP approach, I'm certain he or she will be better able to understand my priorities, communicate effectively, and respect my busy schedule. Read SNAP Selling and learn what it takes to become a priceless asset to your customers." -Suzanne Sheppard, CEO, Executive Conversation, Inc.
"SNAP Selling is a mission-critical tool for building lasting, profitable relationships. Jill goes far beyond defining a sales process by rolling up her sleeves to share specifics about what you absolutely must do to become indispensable to your customer." "Selling has changed radically and Jill Konrath's captured the essence of how to be successful in this new too-busy world. She's a master storyteller and gifted seller. This book is filled with examples that'll make you stop your old-style selling and shift your approach to one of SNAP selling." "Sales organizations of tomorrow will need to be fundamentally different from today. SNAP Selling will not only radically change your thinking, it's one of those rare books that gives you actionable strategies, steps, and examples that differentiate your approach and ultimately the value of your offering. For the next generation sales force, this is a must read!" -Geoffrey Eitland, vice president sales, Staples, Inc.
"At a time when executives face increased pressure to get more done in less time, Jill Konrath shows salespeople how to capture and keep the attention of these key decision makers. SNAP Selling is a real world book from a real world expert." 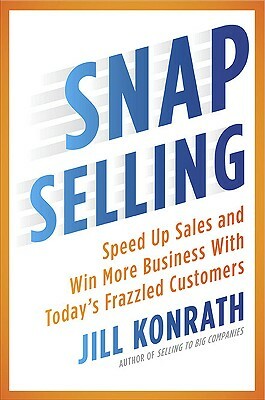 "For all the marketing and salespeople who haven't figured out how to adjust to buyers taking control, Jill Konrath clears that up in SNAP Selling. She doesn't just give you a high-level view, but rolls up her sleeves and provides practical approaches to put her on-target strategies into action." "Jill Konrath gets what buyers deal with on a day-to-day basis and what keeps them from buying. In SNAP Selling, she shows salespeople how to cut through all the clutter and speed up the sales cycle. It's a must read for new and veteran sellers." "SNAP Selling is a game changer. Jill Konrath blasts traditional sales techniques at the same time she offers fresh insights and rock-solid advice that actually works in today's Sales 2.0 environment. It's provocative and practical." "The art of selling has undergone more changes in the past few years than in any other time in history. SNAP Selling shows you how to capitalize on each one of them. Every new and experienced sales professional will find great value in this book. I strongly recommend it." "SNAP is Straight forward, No-nonsense, Attuned and Practical. Jill accurately reflects the realities of many buyers and offers helpful means of cutting through the noise and making the buyer/seller relationship work better for both parties." "In SNAP Selling, Jill Konrath shows you a clear process to be highly relevant to your prospects and stand out from competitors. You'll discover numerous strategies to work smarter, engage customers and gain more business." "With the wealth of information available via the Internet, why does a prospect need a salesperson? Jill Konrath effectively deals with that question in SNAP Selling. While intuitively we may know that as the buy cycle changes, so too must the sell cycle, Jill lays out how to do that. Her blending of new insights, along with real world examples, make SNAP Selling a must read for all sales professionals." "Jill addresses the realities of selling today and the sea change that has taken place. Not only does SNAP Selling clearly articulate what buyers expect from sellers, it also lays out a step-by-step plan on how to be relevant, add value, and move the sales process forward. Other sales books you read and put on the shelf, but this one you'll keep on your desk as a touchstone for effective selling." -Trish Bertuzzi, president, The Bridge Group, Inc.